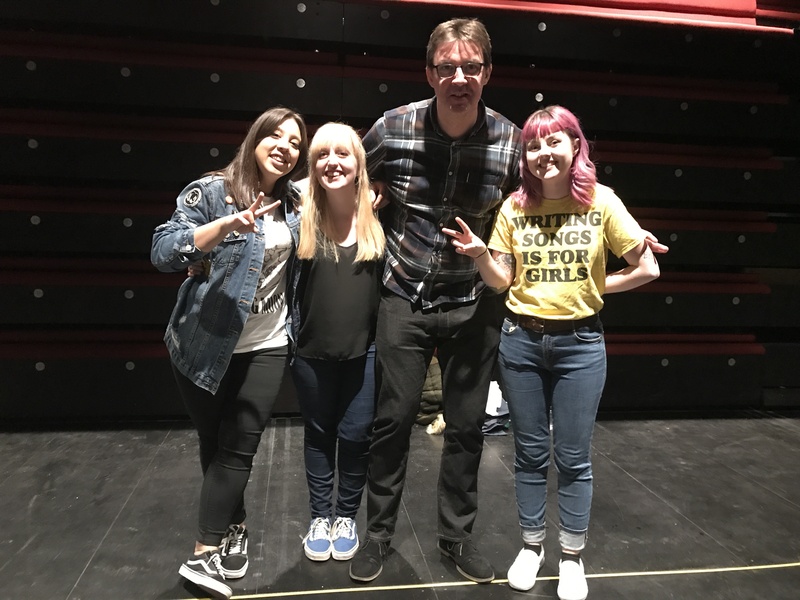 We Are Chester’s music editor Paul Clark caught up with Chester’s rising stars Peaness after a rapturous set at Storyhouse to talk about their new EP and taking part in the Women of the World Festival. It has been a good year for all things cultural in Chester, what with the opening of Storyhouse and the optimism that has generated. The year is shaping up nicely too for Chester’s indie-poppers Peaness, who can count being played on BBC 6Music in the afternoon, a profile in rock bible Kerrang, and a new EP on their list of achievements so far. They can also add being the first headline band to play the Garret Theatre to that list of successes. Even with all of their achievements, there is something grounded about the band, who worried that the noise of their songs was bleeding into the performance of Alice in Wonderland happening somewhere else in the building. This shows no matter how far they have come in the last few years, they are still a bedroom-band at heart – worried what the neighbours have to say. That community aspect of the gig was evident, with everyone in the audience hanging on every word and note from the band. It’s clear to see that they mean a lot to all around the city and they are no strangers to its gig circuit. The opportunity to play Storyhouse was too good to turn down. Also, the chance to be part of the roster for the city’s first Women of the World Festival was important for the band. “As soon as we got asked to do it we thought, we’d definitely like to do it,” says Jess. The question was prompted given not only the event but also an article on The Quietus published in the week preceding the gig, highlighting the experience of producer, engineer and musician Grace Banks, who found working in male-dominated studios often to be an awkward experience. “Yes, that would probably be true. You see so few female sound engineers in the business,” says Jess, when talking about the article. “We’ve done loads of gigs now. You see about one or two women working in these positions. But overall, so far our experiences have been positive,” says guitarist and vocalist, Balla. The band has just released their latest EP Are You Sure? on the Alcopop! label. It contains a number of new songs and also the blink-and-you’ll-miss them early homespun releases. They played a number from the EP at the Storyhouse gig and that release manages to capture all that’s good about the band’s live performance on record. “With the CD and the vinyl you get 10 tracks. So it includes the B-sides of our first EP we put out four years ago. If you get it in physical form, you get all the tracks but online it’s a five track EP,” says Jess. The yellow vinyl is well worth picking up, not just for the quality of the songs but also for the look of the record. It’s 35-minutes of, all-killer, no-filler, that makes you want to flip the disc and go through the album again once it’s finished. In this era of streaming and downloads it is worth having in your collection, something that is important to the band too. “We had a number of limited edition singles, but it was nice to have all our songs on one physical copy,” says Balla. Now that they have released the EP, the next step is to write the album, which is already in process with one song written so far. “It’s been really busy with all the gigs. We find it hard to write more. We’ve played all over the country recently – Wales, Manchester, Leicester and at home. We all work full-time jobs so it’s hard to find the time to fully commit,” says Rach, highlighting the difficulties of having to balance developing a band and working for a living. It seems to be the done thing in interviews to ask the band about their name, so it would be remiss not to ask ‘that’ question again, well a variation of it any way. Not that there is anything wrong with name Peaness, but it was interesting to find out what other choices of names that they had before they arrived at Peaness. “There were literally no other names, we’ve always been Peaness. We couldn’t think of anything worse we couldn’t think of anything better. We’ve been told by a few people, that we should change our name, but it’s too late now,” Balla says. The girls have the good grace not to raise their eyes to the ceiling at this point, having been asked ‘that’ question again. “We didn’t even try. We just came up with a funny one. We’ve always said that serious names are even worse than silly names. That’s all a bit cringey,” says Jess, highlighting a sense of fun that’s not limited to the name, but can be found in their songs too. Even though they do have a serious side, see Oh, George, an exquisite takedown of the former MP for Tatton. Given the way things are shaping up in the world of Peaness, the Garret Theatre might not be big enough to hold future performances. Next time they plug in their guitars they will be playing at Storyhouse’s bigger venue. If that’s the case then it won’t be the band that has to worry about their sound disturbing the neighbours. Peaness will be playing at Telford’s Warehouse on Friday 23 June along with Campfire Social as part of the Chester Live Festival. The band’s new EP Are You Sure? Is available now from Alcopop! Records.